Digital Alchemy is a visual music work that consists of visuals crafted by Maura in response to a fixed media version of a music composition titled “Gala” by composer Cobi van Tonder. 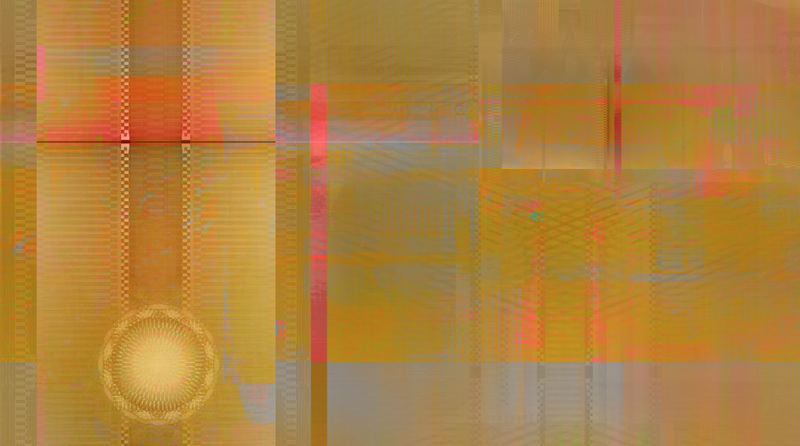 The visual music work explores the idea of the transformation of digital visual material through blending colour, merging different motions and speeds and applying symmetrical operations on raw and transformed material, however, the music composition provides the expressiveness, structure and energy from which the visuals are composed. Maura McDonnell was interested in exploring the materiality and immateriality of colour and emerging forms that can be crafted with digital video tools. Working with some sketches of what she would like to achieve, she set about setting up the initial visual in the software Adobe Premiere. The visual was a photograph of a light box with stained glass. This became the source material for generating colour, form and texture. At a very early stage, the source image was no longer recognisable, and the images that were developed were used and re-used as new source material. Each re-use generated new colour results and motion effects. The images were animated, and layered and crafted akin to how a sculptor might craft stone to build their sculpture. The music was used as a type of structure and ground from which the motions and synchronisation of colour and motion events were aligned. The result is a deep listening experience of the music, which then becomes an important phenomenological addition to the choices made for the crafting and sculpting of the visual material. Many layers were output, discarded, re-used until something emerged for the artist after working with this process and the materials generated. At times, the material generated started to look like spun gold, and so the idea formed that this process and visual result of emerging colours and forms, that were forming and disappearing was a form of alchemy in digital form. Eventually, the visual emerged that the author felt met the initial intentions and felt right for the music composition. Titled after a Bridget Riley painting of the same name, Gala exists in a meta tuning system: a G harmonic series, 5-tet, 21-tet and 34-tet are all stacked on top of each other. From this only a small number of pitches are selected by ear to create a new meta scale of 34 pitches. This allows for vibrations and beatings with varying intensities. The approach to form is strongly inspired by James Tenney: through simple macro gestures, the microtonal world can open up, breath and reveal itself in vertical directions. Similar to a sunset, colors shift and change, intensity changes, but everything else is still. Maura and Cobi were co-colleagues on a PhD programme at Trinity College, Dublin and had talked of working together on visuals and music. Cobi completed her PhD and a suite of microtonal music compositions. She invited Maura to work with one of these compositions in her visual music practice.